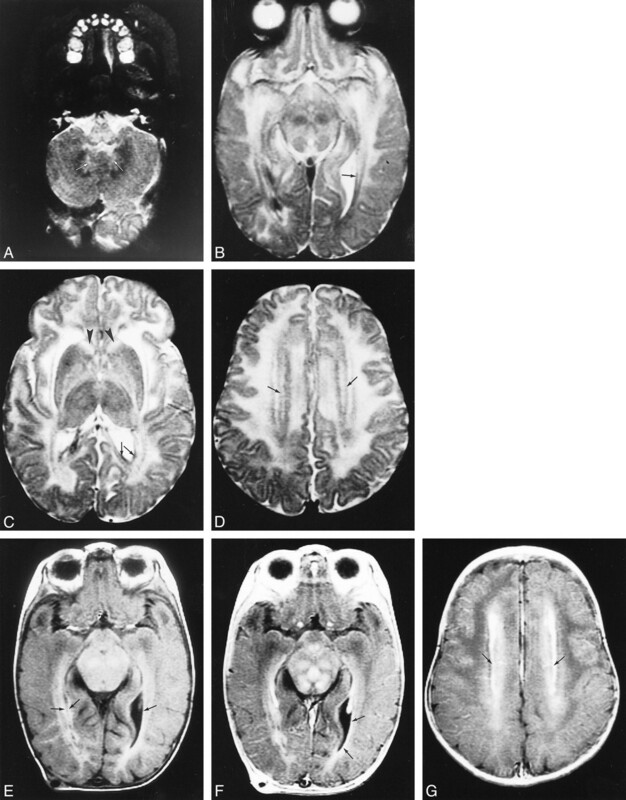 Early MR imaging study at the age of 4 months in a patient with autopsy-proved infantile Alexander disease. A–D, T2-weighted images show abnormally high signal in the medulla (A), the hilus of the dentate nucleus (arrows, A), the entire midbrain except for the red nuclei (B), the basal ganglia, and the thalamus (C). The frontal white matter has a slightly higher signal intensity than the occipital white matter (C). The head of the caudate nucleus is swollen (arrowheads, C). Around the ventricles, there is a rim of low signal intensity (arrows, B–D). 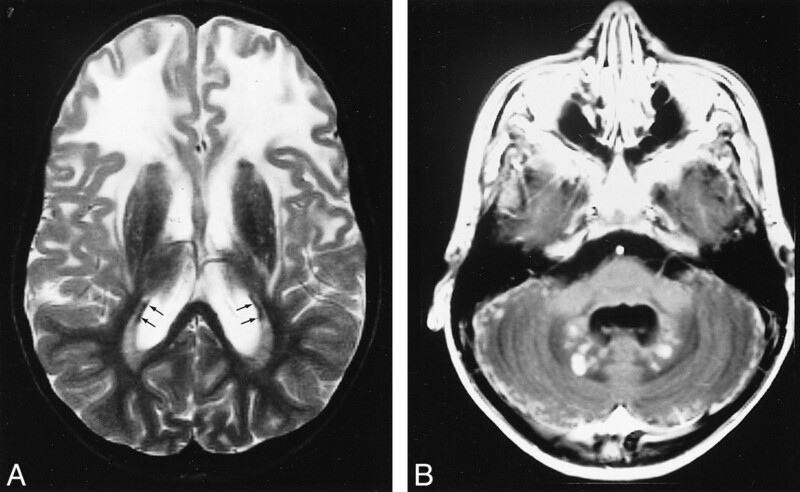 E–G, T1-weighted images show high signal intensity of the periventricular rim (arrows, E). 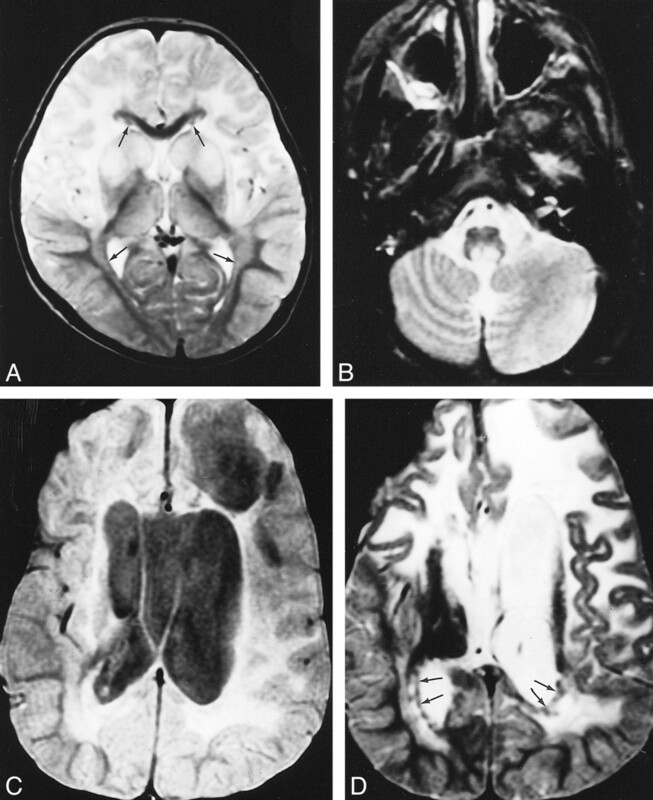 After contrast administration, the T1-weighted images show enhancement of areas in the midbrain (F), ventricular lining (arrows, F), and periventricular rim (arrows, G). MR imaging of a patient with biopsy-confirmed infantile Alexander disease. A and B, At the age of 1½ months, the frontal white matter has a slightly higher signal intensity on T2-weighted images and slightly lower signal intensity on unenhanced T1-weighted images than does the remainder of the cerebral white matter, which has normal signal intensity for unmyelinated white matter. There is a periventricular rim of low signal intensity on T2-weighted images (arrows, A) and high signal intensity on T1-weighted images (arrows, B), with some extensions into the frontal white matter (arrowheads, A and B). The caudate nucleus and putamen have high signal intensity on T2-weighted images and are mildly swollen. C and D, At the age of 3 months, a major increase in ventricular size is seen with extreme thinning of the posterior cerebral mantle. The frontal white matter has a more abnormal signal intensity than the occipital white matter, appears markedly swollen, and shows early cystic degeneration (arrows, D). There is a thin periventricular rim of low signal intensity on T2-weighted images (arrows, C). The basal ganglia are now markedly atrophic. After contrast administration, enhancement occurs in the ventricular lining, caudate nucleus, putamen, frontal white matter, and parts of the frontal cortex (D). 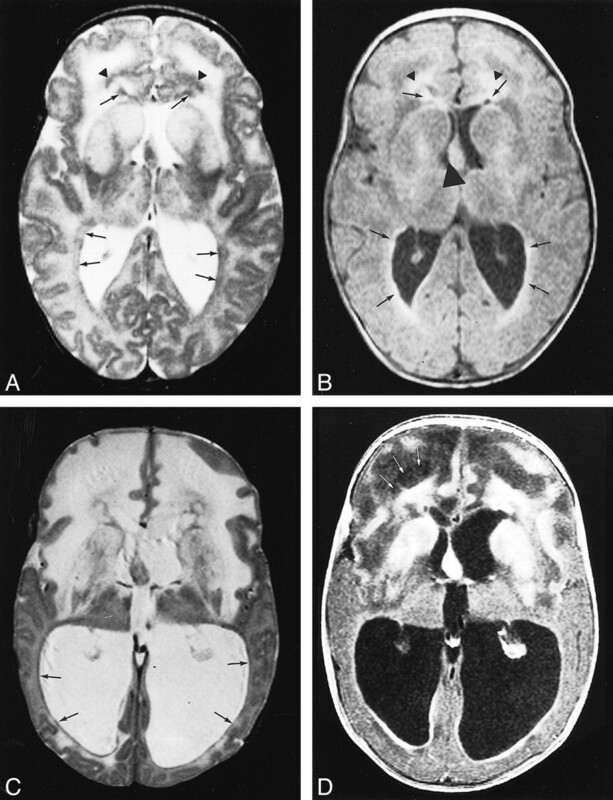 Early MR imaging studies in a patient with presumed juvenile Alexander disease, obtained at the age of 4 years. A and B, Extensive cerebral white matter abnormalities are seen on these T2-weighted images (B), with sparing of the occipital U fibers (arrows, B). The signal abnormality is more pronounced in the frontal than in the occipital white matter. There is an irregular periventricular rim of low signal intensity (arrowheads, B). The basal ganglia and thalamus have a mildly increased signal intensity. Within the posterior fossa, signal abnormalities are seen in the central part of the medulla, the hilus of the dentate nucleus, and the cerebellar hemispheric white matter, characteristically with the normal dentate nucleus prominently visible in between (A). Late MR imaging study of a patient with presumed juvenile Alexander disease, obtained at the age of 10 years. A and B, There is extensive white matter involvement with frontal preponderance (A). The basal ganglia are dark and atrophic on T2-weighted images (A). A thin periventricular rim of low signal intensity is just visible (arrows, A). After contrast administration, enhancement of the entire cerebellar surface and dentate nucleus is seen (B). Neuropathology for the neuroradiologist: rosenthal fibers.